As a financial planner, Ben Jacobs (BSFCS ’16, MS ’16) helps remove the financial barriers that stand in the way of his clients – and future Bulldogs. Ben Jacobs (BSFCS ’16, MS ’16) works as a financial planner, helping his clients reach their life goals by planning for the future. In the spirit of gratitude, he gives to his alma mater to help fellow Bulldogs reach their own UGA milestones. Ben supports the ASPIRE Clinic Fund and Financial Planning Fund to provide current students with the same financial resources he received as a student. He is a member of the FACS Alumni Association’s Young Alumni Council. Ben Jacobs (BSFCS ’16, MS ’16) was originally majoring in environmental economics and management at the University of Georgia when a new interest in finance ignited within him. As a first-year student, he began advising his friends on the kinds of bank accounts they should open or the credit cards they should use. He discovered a passion for helping his friends save and spend their money smartly, and he decided to connect this new passion with his career path. Today, Ben works as a financial planner at Elwood & Goetz Wealth Advisory Group in Athens, Georgia, helping his clients plan for the future so that they can reach their life goals. Ben attributes much of his current success to the scholarship support he received at UGA. In fact, his scholarships made attending UGA possible in the first place. Ben earned his bachelor’s degree in consumer economics and master’s degree in financial planning from the College of Family and Consumer Sciences (FACS) in 2016. 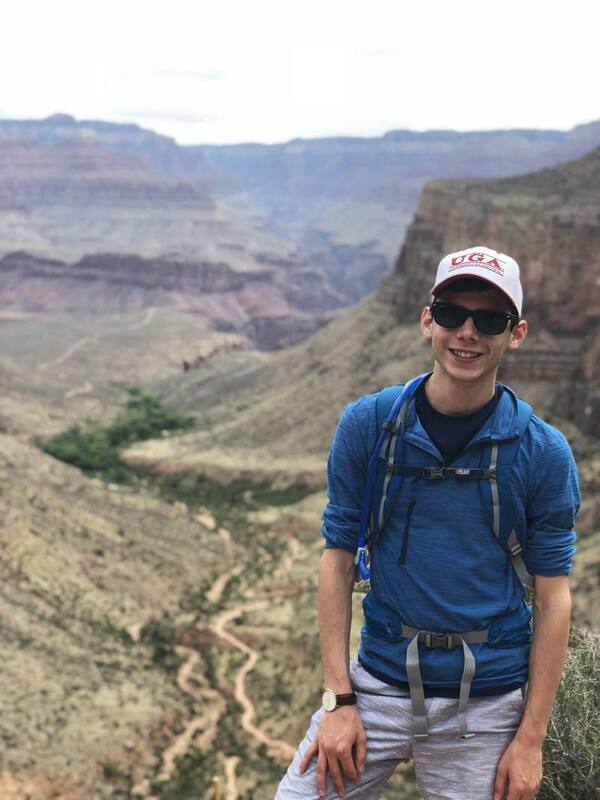 Scholarships from the Honors Program, Office of International Education and FACS also gave Ben the financial freedom to gain real-world experiences while a student. He studied abroad in Costa Rica, volunteered in the Athens community and sat on the board of UGA’s Habitat for Humanity. Now, he gives to several areas on campus to help remove any financial barriers that may stand between students and the experiences needed to reach their professional goals. Ben wears his pride for UGA wherever he goes. Ben at the 2017 homecoming game with his partner, Cody Nichelson. He is a UGA grad (ABJ ’14). As a financial planner, Ben helps people reach their life goals every day. Whether it’s financing a new car or purchasing a house, he enjoys helping his clients achieve their dreams. 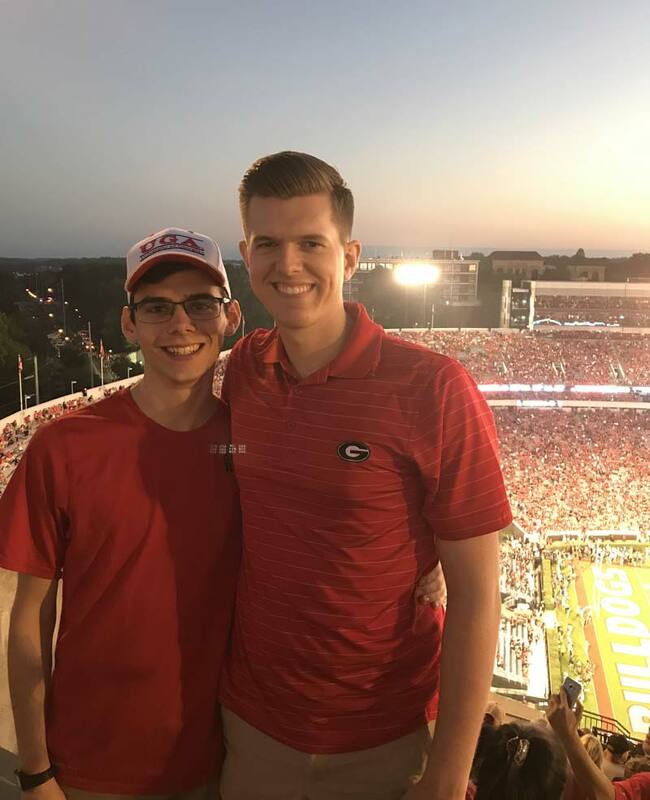 As a student, Ben worked as a service provider at UGA’s Acquiring Strategies for Personal Improvement and Relationship Enhancement (ASPIRE) Clinic. At the ASPIRE Clinic, students provide supervised counseling services to the community, including: therapy, financial and nutrition counseling and education, and legal problem solving. Ben was able to apply the knowledge he learned in the classroom to real-world situations, all while helping many community members who would not otherwise have been able to afford help with their finances. The clinic helped shape the start of Ben’s career, and now he supports the ASPIRE Clinic Fund with a spirit of gratitude. In the same way that Ben helps his clients achieve their life goals, he gives back to his alma mater to help fellow Bulldogs reach the milestones – like presenting at a conference or studying abroad – that were so meaningful to his educational experience. He gives to the Financial Planning Fund to help students participate in competitions, attend conferences, network with professionals and advance in their careers. “I had a lot of support given to me when I was in school that allowed me to get where I am today, so I want to be able to repay that,” said Ben. Ben also serves as the chair for the Young Alumni Council on the FACS Alumni Association. As a board member, he encourages alumni to continue their engagement with the college through event programming and fundraising opportunities. He also supports the FACS Alumni Association Fund to help fund alumni outreach and engagement opportunities, as well as FACS scholarships.